What happens when someone hosts 3 blog events back to back, creating a hatrick!!! She checks her mail box religiously every morning as soon as she gets up only to realise it’s all over… At last!!! Talking of home food, I have been cooking some simple foods these days. Not many ingredients and no complex techniques. I have been experimenting with few spices, tweaking here and there till I am satisfied with the end result. 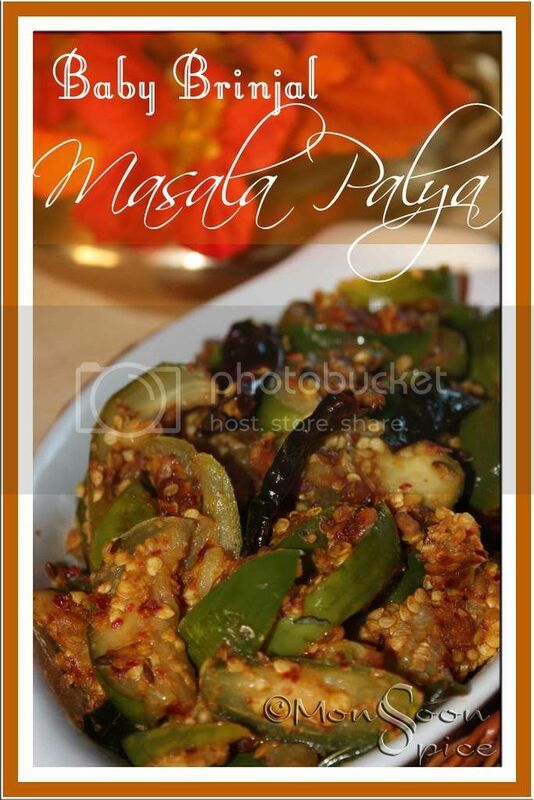 One such recipe is Stir Fried Baby Green Brinjals or Baby Geen Brinjal Masala Palya. Recent trip to down south, I bought few lovely green baby brinjals which are otherwise not available in my neck of woods. The speciality of these brinjals is that they have thin lovely green skin with lots of seeds within. They take very little time to cook compared to the purple baby eggplants and taste oh-so-wonderful. I didn’t want them to over cook so the option of stuffing them was out of the window. After thinking for a while I opted to slice them and stir fry with just few spices which would bring out the flavour of these green beauties. The recipe is inspired by recent post of Dondakaya Vepudu but with my own twist. I have used same ingredients for the spice blend but also added few other ingredients to give it little smoky and complex flavours. Addition to cumin, dry red chillies and roasted peanuts, I also added garlic, tamarind and little jaggery. The result was simply delicious where I ended up eating half the content right from the pan. The pungent garlic, sweet jaggery, sour tamarind and smoky dry red chillies were pure pleasure to be experienced. And the best part was hubby dear is allergic to eggplants, so I had it all for myself;) You can try same spice blend with other vegetables like Ivy Gourd/Tindora or even purple eggplants and I am sure it will taste equally good. Remove the stems of baby brinjals and cut it vertically in the middle. Slice each halves into 1 cm slices. Place the sliced brinjals in a vessel filled with cold water till required. Immersing brinjals in cold water helps in preventing discolouration. To make spice powder, heat few drops of oil in a pan and add cumin seeds, halved chilles and finely chopped garlic. Roast them in low heat for a minute till garlic turns light brown and cumin seeds too turn light brown. Let it cool down a bit before you proceed to next step. Place them in a mixer along with roasted peanuts, tamarind pulp and jaggery and grind into fine powder without adding any water. Keep this aside till needed. Heat oil in a same pan and add channa dal, urad dal, mustard, dry red chillies and hing. Sauté it on medium flame till mustard starts to pop and splutter. Now add cumin seeds, sliced garlic and curry leaves and sauté till cumin, dal and garlic turns light golden brown. Drain water from sliced brinjal pieces and add them to the pan. Increase the heat and stir fry them continously for about 5 mins. Add turmeric powder and salt to taste and give it a good stir for another 5 mins. Mix spice blend and stir fry for another 3-5 mins till all the flavours blend well and brinjal pieces are cooked to tender. 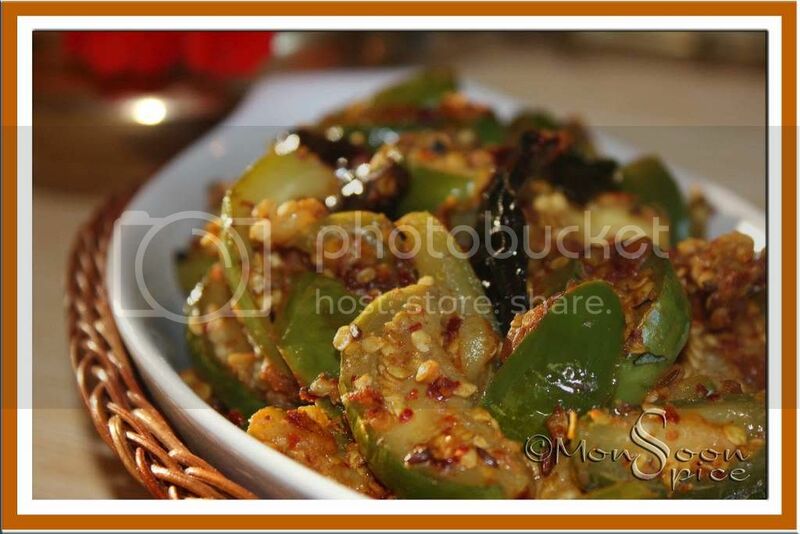 Serve this delicious stir fry with steaming bowl of Rice/Chapatti and Rasam/Dal/Plain Yogurt and enjoy. For those green babies, I just need to go to the corner chinese store to get a basket full! Only the seed will be bothering me! Lovely presentation of the dish. the red chillies look so yum :) i love brinjals/eggplants! Hey Sia lovely twist to the traditional palya. enna all time fav veggie is badane..
You do need a break girl. Enjoy the silence after all those events. 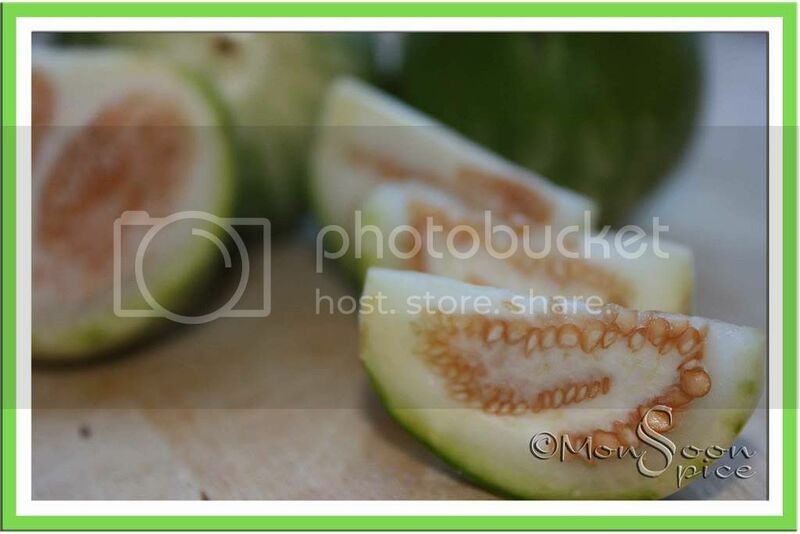 They almost resembles guava slices in the second photo! lovely! Mouth watering! A wonderful recipe. Might try it with my larger ones. never tried it before with peanuts and daal temperings. lol, looks like u like brinjals as much as i do Priya. i found them in one of teh indian shops in during our recent trip to Wembly. u r one lucky girl Cham. we have to travel miles together to get them. infact this was the first time i had found green brinjals here in UK. ee lo, ek aur guava ladki. he he... I agree with u Sra. Suni, they are indeed cute. i was so happy when i found these little gems when we went to Wembly last month. PG, give it a try and see how you like it. :) if you are a brinjal and peanut lovers like me, then u r sure to fall in love with this dish. I'm not sure I've ever seen brinjals in the States. We have several types of eggplant here though, so I'll have to try this. It looks absolutely wonderful. I loved the pic! The recipe looks great too :) I wish I could find baby brinjals here to try this dish out. this is tooooo good Sia. It is tempting me very much. and I can feel water in my mouth. very good. Lovely recipe....love to make diff varities palya in brinjal.. I agree with you, at times ai wud be in no mood to cook something elaborate, n i wud like some simple anna saaru with some palya .. heavenly ... i liked ur version of badnekai palya .. looks great ..
that's looking so nice and join in the chicken event going in my blog! you indeed need some break :) I can imagine you going and checking the emails, after hosting 3 events in a row, lol.. This is my first time here... u have a lovely space!! I am jus a week old in this blogsphere...Jus popped in to say a hi! I love brinjals like anything!! !Looks so delicious Sia! oh, oh, oh! the curry look so mouth-watering Sia! Lovely pics as usual. Reg. my dal curry recipe: Sorry for the confusion. I used toor dal for the curry. I updated the same in the recipe too. Susan, You will find small purple varities in any indian stores.if not you can use usual purple eggplants and it will work fine. make sure you cut them into thin slices. try with normal purple ones you get A & N and they will work just fine. then this one if for you Vanamala. its quite different from the usual palya we make and very delicious. thank you, Srilekha for event invi but i am a vegetarian. so can't participate in ur chicken event. Looks very nice and tempting as i love brinjals. love to have this with dal and rasam. Vow, baingan is my favourite and with this subji, it's really mouthwatering. Thanks for the recipe Sia. yah i stay in huddersfeild and wembly is a lonng travel,but will try to go...........atleasy for those cutie pies. I love those baby green brinjals, and lucky for me, they are available at my local Asian grocery store. This palya looks just delicious, Sia. hey brinjal queen!! I see that your new cam is working wonders!! then it's ahigh time u tried it again dear Swati. how have u been? haven't seen u blogging for quite some time. hope all is well at ur end. 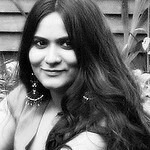 can u mail me at sia[at]monsoonspice[dot]com Priya? LOL, brinjal queen? who me? u crack me up Coffee. hw have u been? haven't seen u online since long time. Love green brinjals over the purple ones anyday! and these look delicious! I prepared this yesterday without the garlic and it still tasted nice. My inlaws do not eat garlic, so I made it without it. Thanks, it tasted good. Like your husband, mine too is allergic to eggplants and I ate it all! Dudhi-Aloo Masala: What's Your Favourite?